We live in the company of the saints. We are in communion with them, and communion implies communication. There is, at every moment, a mysterious exchange taking place between us and the saints who surround us. The Letter to the Hebrews says that we are “watched from above by such a cloud of witnesses” (Hebrews 12:1). The names of saints are more and more rarely being given to Catholic babies. While there is a part of ignorance here — today’s parents were the victims of the disastrous lack of catechesis that followed the Second Vatican Council — there is something more. The pressure to secularize every area of life is picking up momentum. Change what people say, and you will change what they think. The modification of vocabulary — and in this case the suppression of the glorious heritage of Catholic saints’ names — will lead to a modification of values and, ultimately, of morality. Monasteries have the splendid custom of attributing a saint’s name or a biblical name to every room and place — from the cells to the workrooms to the storage rooms. 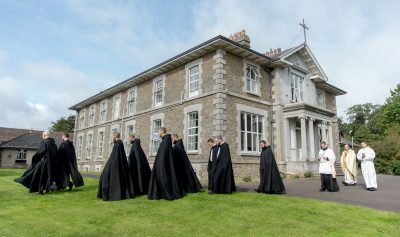 The significance of this age-old custom is as beautiful as it is profound: the monastery is inhabited not only by the visible people who live within its walls, but also by its invisible residents, the angels and the saints. The naming of a room for a saint is a confession of faith; it flies in the face of secularist ideologies that would have us believe that reality stops with what is visible. The movement, even among some ecclesiastics, to secularize every person, place, and thing is as pernicious as it is aggressive. It is part of the “smoke of Satan” that Blessed Pope Paul VI (Homily, 29 June 1972) saw penetrating the Church to foment confusion. It is important that we respond to the crisis with courage and with conviction. The invasion of the secular must be countered by a concerted recovery of the sacred, and by re-claiming all things for Christ under the patronage of his saints and his mysteries: our cities, our towns, our homes, our institutions, our rooms, and, yes, our children. Eight years ago, Pope Benedict XVI’s Motu Proprio, Summorum Pontificum, generated some helpful comparative studies of the Rite of Blessed John XXIII (the Mass actually celebrated during the Second Vatican Council) and the 1969 Rite of Pope Paul VI. One of the observations made was that the newer rite, in a misguided attempt to render the Mass less offensive to Protestant sensibilities, removed several key allusions to the Blessed Virgin Mary, to the saints, and to their intercession (eg. Confiteor; Suscipe, Sancta Trinitas; Libera nos). In no way was this manipulation of the texts authorized by the Conciliar Fathers. In fact, it grieved and alienated the venerable Orthodox Churches (honoured by the inclusion of Saint Andrew the Apostle in the Libera nos), who interpreted it as a rejection of the patrimony of the undivided Church. One wonders if, under Cardinal Sarah’s guidance, a future edition of the reformed Missale Romanum will not restore the saints to the Libera nos. For those who use the reformed Ordo Missae such an inclusion would be a signal boon. Under Saint John Paul II, and Pope Benedict XVI, it was clear that the ecumenical efforts and predilection of the Church of Rome were turned Eastward, toward those true Churches having Apostolic Succession with whom the Church of Rome shares the Most Holy Eucharist and the other sacraments. Protestant communities, while having some elements of the true Church and certain means of salvation derived from her, are objectively defective. The Church of Rome gains nothing, and loses much, by seeking to resemble them, especially by minimizing the intercession of the Mother of God and of the saints. This does not mean that the Church of Rome abandons them. On the contrary, she seeks to dialogue with them — as would a loving mother with an alienated child — and waits for them to return to the fullness of the faith held in her heart. The feast of Saints Joachim and Anna invites us to consider all these things. 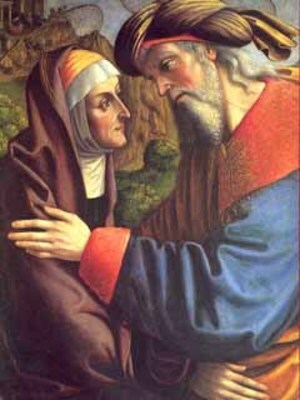 Saints Joachim and Anna arrived in North America with the first colonizers from France and Spain, those who named every new place for the saints of Christ. By this, they made it clear that the Kingdom of Heaven was also expanding and that all places and peoples were invited to live in communion with the saints, and under their protection. In seventeenth century France devotion to the Holy Family became a mark of the renewal that, following the Council of Trent, blew through the Church like a refreshing breeze, a mystical invasion. The Holy Family was understood, at that time, to refer to the entire extended family of Jesus, including his grandparents, Joachim and Anna. The Normans brought devotion to Saint Anne to Ireland and established a shrine in her honour in a chapel dedicated to Saint Audoen, Bishop of Rouen, at Cornmarket in Dublin. Dublin’s devotion to Saint Anne dates from 1169/1170, and developed around the a relic of the finger bone of Saint Anne that the Normans brough with them to Ireland. So fervent was popular devotion to Saint Anne that by 1352 the festival of Saint Anne on 26th July was declared a holyday of obligation. In 1431, King Henry VI granted letters patent establishing the Guild of St. Anne – “to the praise of God and of the Blessed Virgin Mary and in honour of St. Anne”. Six priests were necessary to tend to the needs of pilgrims from within Ireland, from Britain and from the Continent. The Church contained a Lady Chapel honouring both the Blessed Virgin Mary and Saint Anne. The Seal of the Guild of Saint Anne can be seen today in Saint Audoen’s Church. From France, Jesuit missionaries, Ursuline and Hospitaller nuns, and devout layfolk carried the devotion to the Holy Family to New France. A sanctuary dedicated to Saint Anne was built in 1658 between the Saint Laurence River and the Beaupré coast in Québec. Other smaller shrines to Saint Anne, in Isle La Motte, Vermont, in Sturbridge and in Fall River, Massachusetts, and in Waterbury, Connecticut, mark the “Catholic geography” of New England. After the French Revolution, the Church enjoyed an extraordinary burst of energy characterized by the foundations of hundreds of new religious communities of women; many of these nineteenth century foundations were dedicated to the Holy Family and, again, the grandparents of the Lord were not excluded. Some of these French communities came, in turn, to America where they taught generations of Catholics to reverence the human family of Christ and to live in communion with the saints. Saint Anna and Saint Joachim have a special message for grandparents. Grandmothers and grandfathers have a particular vocation in the order of grace. Grandparents are called to foster the supernatural life of their grandchildren, to pray for them, to pray with them, and to model holiness for them. Grandparents can reach places in a child’s heart that no one else can reach. Grandparents can introduce their grandchildren to the joy of living with the saints. We are the spiritual descendents of the saints. We profess our faith in the communion of the saints and acknowledge their presence in our homes and in our lives. We renounce the evil ideologies of secularization that, by suppressing the things that call to mind the saints, aim at erasing the supernatural from daily life. In the Holy Sacrifice of the Mass, heaven descends to earth and earth is assumed into heaven. In the Holy Mass there is infinitely more than what meets the eye. Saints Joachim and Anna are present to us; their most holy Daughter, the Immaculate Virgin Mary, Mother of God, is present to us. Let us ask them to join their intercession to ours, imploring peace for the whole world, and blessings upon our families. This, too, is the communion of the saints: the Holy Sacrifice offered here can bring peace and blessings to thousands of hearts and places. Live then, as if you were seeing the invisible! There is nothing more real than that.